MasterCard features A-Team tough guy Mr T in the latest Priceless television commercial. 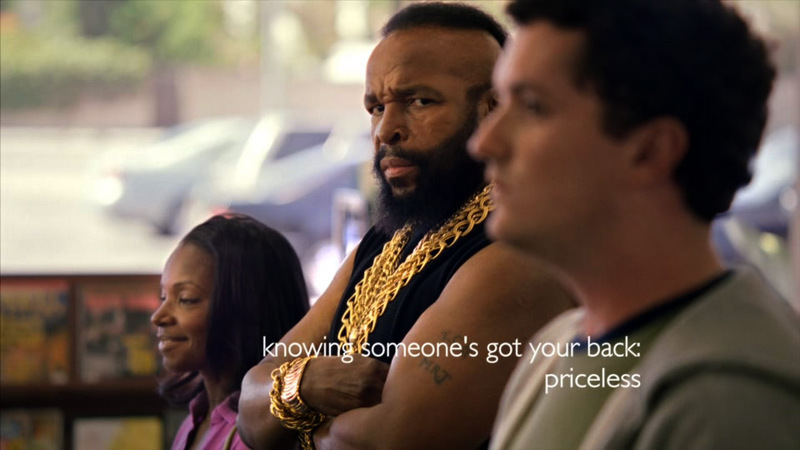 Mr. T looks as tough as ever (albeit a little older), standing, arms crossed, beside a woman as she goes to the dry cleaners, the beauty salon, and the grocery store. The A-Team tough guy dares any punks to step to his charge, standing in as a symbol for MasterCard’s great consumer protections. Bodyguard ad was developed at McCann Erickson New York by chief creative officer Joyce King Thomas, group creative director Vann Graves, copywriter Kate Lummus, producer Jonathan Shipman. Filming was shot by director Harry Cocciolo via Bob Industries, Santa Monica, with director of photography Stefan Czapsky, executive producers TK Knowles, John O’Grady and Chuck Ryant. Editor was Stephane Dumonceau at Final Cut, New York. Post production and effects were produced at Absolute Post by Lead VFX artists James “Krispy” Cornwell, Aniello Zampella, VFX artist Krissy Nordella, executive producer Sally Heath and producer Nirad “Bugs” Russell.